of Uyesugi is projected onto the screen. 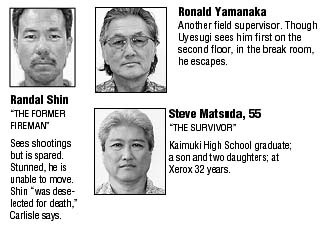 An employee whose life was spared in the Xerox slayings, a son and surviving spouses of the seven slain men are expected to take the stand in the murder trial of copy machine repairman Byran Uyesugi. Randal Shin, who escaped death, and Reid Kawamae, son of Xerox service technician Ron Kawamae, are included in a list of more than 11 witnesses expected to be called by the state when the trial for Uyesugi resumes tomorrow in Judge Marie Milks' courtroom. Uyesugi had the opportunity to kill Shin but chose not to, city Prosecutor Peter Carlisle said yesterday during opening statements: "He was deselected for death." 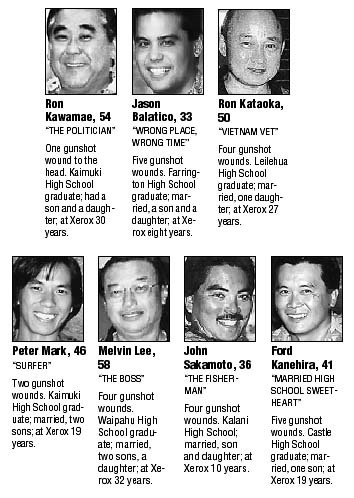 Xerox employees Ronald Yamanaka and Lance Hamura, who also were spared. Honolulu Police Department employees Darryl Castillo, Roland Turner, John Wadahara and Erika Kaneaiakala-Liashenko and Clarence Fraser. George Moad and Valerie Nakahara, who did contract work for Xerox. The state is expected to produce testimony from various witnesses to show that Uyesugi acted "knowingly and intentionally" when he caused the deaths of seven of his co-workers, and attempted to shoot another. The defense is claiming that because Uyesugi suffered from a mental disorder, he was unable to know right from wrong or act according to the law, and therefore should not be held responsible. Carlisle yesterday outlined what witnesses are expected to testify to in the upcoming weeks. Hamura, not a target of Uyesugi's anger and hatred, apparently spoke briefly to Uyesugi on the first floor before Uyesugi embarked on his rampage on the floor above, Carlisle said. Uyesugi appeared calm and normal. Uyesugi apparently walked past Yamanaka, who was having coffee in a second-floor break room, and went to a computer room at the end of the hall where two other co-workers were. "He aimed the gun directly at (Ron Kawamae's) head, and pulled the trigger," Carlisle said. Jason Balatico, who witnessed the shooting, charged toward Uyesugi in an effort to wrest the gun away, but Uyesugi fired "a hail of shots" at him, downing him with five shots. Shin, who was sitting next to Kawamae in the computer room, saw "the explosion of blood from Kawamae" and went into shock, Carlisle said. Uyesugi ignored Shin and instead walked down the hallway to the conference room, where he fired multiple bullets into his supervisor, Melvin Lee, and four other co-workers, Ronald Kataoka, Peter Mark, John Sakamoto and Ford Kanehira. Uyesugi allegedly turned a wounded Sakamoto to face upward and fired into him again as Sakamoto's eyes remained open. He had to reload to kill Kanehira, his last victim, Carlisle said. None of the spouses of the victims was in court yesterday. Families of the victims have declined requests to be interviewed, asking that the media respect their need for privacy during the trial, expected to last six weeks. "It's a very difficult time for them," said Mari McCaig, victim witness counselor who met with family members over the weekend to answer questions about the trial. Technically adequate. Lacked people skills. Short-fused. Resistant to training. Unpopular with co-workers. Overall, a disgruntled, problem employee, is how the state described copy machine repairman Byran Uyesugi, charged in Hawaii's worst multiple slaying. But although he suffers from a delusional disorder, Uyesugi knew right from wrong and was capable of controlling his actions when he opened fire on a select group of co-workers, said city Prosecutor Peter Carlisle. The state portrayed Uyesugi as a methodical killer who knew what he was doing when he spared some co-workers, but pumped 25 shots into seven others. "He decided who would die, who would live, when and where they would die and how they would die," Carlisle said. Xerox was closing in on Uyesugi, or so he believed, and he needed to strike back. "I had to do what I had to do to make a point," he told a police negotiator as police attempted to get him to surrender later that day as he sat in his van near the Hawaii Nature Center. His co-workers had been "messing with him," making him look bad. The company was conspiring to terminate him. Federal agents were spying on him, planting bugs at his home and in his car, he told doctors. He chose Nov. 2, 1999 because he knew the people he was targeting would be at a meeting that morning, Carlisle said. 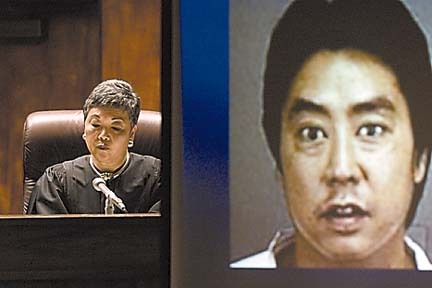 Defense attorney Rodney Ching did not dispute his client committed the seven killings, but he said Byran Uyesugi was suffering from a serious delusional disorder that affected his ability to tell right from wrong. "He lacked substantial capacity to understand the wrongfulness of his actions," Ching said yesterday. Ching described Uyesugi's mental illness as "serious, long-standing and deeply ingrained." At home Uyesugi was "tormented" by a "strange black shadow" that poked at him constantly.To stop the poking, which caused him physical pain, Uyesugi picked up a knife or a screwdriver to poke back at the shadow. At work, Uyesugi believed other employees were spying on him, sabotaging his work and conspiring against him, Ching said. Uyesugi also believed one of his colleagues was stealing his goldfish and mutilating them. Uyesugi's distorted thinking was known to his Xerox supervisors beginning in 1992. 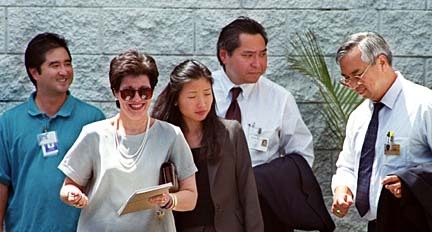 Xerox forced Uyesugi to undergo psychiatric evaluation and treatment in 1993 after he kicked in an elevator door, Ching said. Doctors at Castle and Kaiser hospitals diagnosed him with paranoia and delusional disorders. "His delusion continued and it expanded, and it got worse, and worse and worse," Ching said. And by the time of the killings, "the line between reality and delusion was blurred."